On Saturday, while Oliver was in the midst of a major meltdown, I kept digging in my brain for what to do. I kept trying to remember what the books said. I knew Oliver had a busy week – too busy. He has been playing with an older boy at school, a charismatic funny child who also likes to push boundaries and do things like climb over the school fence during morning circle. We had two playdates after school and another day spent visiting a nearby public works station where we climbed into dump trucks and snow plows. To put it simply, I had done too much. But I couldn’t. I was in panic mode, not observation mode. I was on the floor with Oliver while he was yelling his head off, trying to keep his brother safe, feeling compassion and fury and love and frustration beating along with that overwhelming feeling of inadequacy. Of failure. After it was finally over, I set Oliver up in his bed with some books for a rest and I took Gus down to the sandbox. I needed to be outside. I needed to breathe. I needed to escape. I wanted to hide from the barrage of thoughts that kept saying I had failed yet again, that I hadn’t provided an ideal environment, that my son was not behaving the way he should, that my life had fallen so far short of what I had imagined it was going to be. I wanted to disappear for a while into someone else’s life. Seeing how I was sitting next to a People magazine with photos of the royal wedding, this was easy to do. I smiled and put down the magazine. I had just been engrossed with photographs of Princess Di’s saphire necklace, Kate Middleton’s earrings, her Cartier tiera stuffed with diamonds. 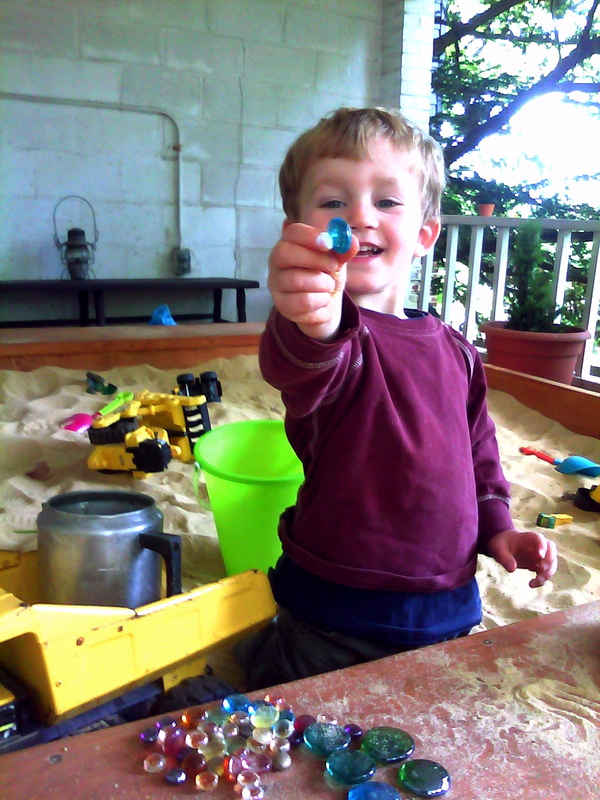 But here, all along, right in front of me, my child had been handing me fistfuls of jewels. As we sat there, a dove flew into the light above our heads. A couple of months ago, we found a nest in there with two small eggs and since then, the mother has been diligently sitting on it, her tail feathers peeking out over the top. A few weeks ago, the birds hatched and now are almost full-grown. The parents have gotten used to us there in the sandbox and, for the most part, ignore us, which makes me feel honored. On Saturday, as Gus’ fingers were curled around colored stones, the father bird flew back to the nest in a flutter and coo. He opened his beak and the baby bird stuck his head all the way into his father’s mouth to eat what was presented in such a royal manner. It beat the pants off any magazine wedding. Most of being a parent, for me, has felt like a long, slow dismantling. An unpacking of all of my ideas of how it is supposed to be, how I am supposed to be. There was this idea I had, before I was a mother, of what my children would be like. And somehow, this thought – based on nothing more than an idea – became the ideal. But being a parent is never ideal. It’s not anything like the magazines tell you it will be. Photographs can tell you nothing about either the gems or the meltdowns. Parenting is gritty and hard and uncomfortable. Before you can even begin to make progress you have to backtrack first. You have to let go of who you thought you were. You have to give up on the ideal temperament and the ideal environment. You will probably have to give up on your dream of an ideal family. You might have to give up your job. You will definitely have to give up your freedom. And for sure you will give up on the idea of yourself as the ideal parent. Yes, definitely that. Especially that. Finally, when you are left with nothing of what you started, when you are reduced to only your complexity – your unorganized pile of questions – then and only then can you begin. You will probably feel a bit unmoored. Shipwrecked. Lost. And then will you be handed a coffee pot full of gems. Your lights will be filled with birdsong. You will begin to notice the miracles that are right there, that have suddenly sprouted up under your eaves. The miracles that have been there all along. Wow, Pam. Once again, so gorgeous, such an outrageously beautiful evocation of things I think about all the time. A long slow dismantling … yes. Gritty, hard, and uncomfortable … yes. The miracles that are here all along … yes. Gorgeous and universal. They do hand us the most incredible jewels. I know you think you are struggling with this mothering thing, Pamela, but I think you are mining for gold. You seem to have hit a deep vein, too. And you sift through the rubble and then present us with pure, pure gold. There’s this… “You have to let go of who you thought you were. ” and the whole last paragraph… just exquisite. I believe you are a treasure. Is it silly to admit that this is something I learn again and again, over and over? It just won’t stick. Life is too fast, too easily distracting, and the slow moments are the ones, for me, that teach. Except, unfortunately there aren’t enough of them. There isn’t enough of me, you know? But a lovely reminder. Such beautiful words. Bravo. Is the mere fact that you are giving up on the idea of making yourself an ideal parent, making you MORE of an ideal parent….? Nothing is ideal….give your kids love, the rest is gravy! There is so much I in this post that speaks to me, on so very many levels. How incredible to read your words and to feel such a deep kinship. Indeed motherhood has been my own dismantling, though only know, several years, am I allowing the pieces to fall as they may. I can’t help but think that if we only knew this before it would be far easier to manoeuvre, to settle in. Then I remind myself that it’s the sort of thing that only comes by living it, and that is the true lesson. Wonderful, evocative writing. And I’m all over your idea about burying the gems. My own two boys would love that. This “dismantling” process is part of what stops my hubby and I taking the plunge into parenthood I think. We like our “us”ness. And we like control. And we just know that along with all the joys parenthood will almost certainly give us, it will definitely challenge these elements of ourselves the most. Your post is so eloquently written. It is also comforting, as it confronts these uncomfortable aspects as “just the way it is” and forges forth unhindered. Thank you. The dismantling may be the greatest gift of parenthood to allow us to get to our own gritty core. Pam, lovely and so well written and the story about Gus handing you the stones made me laugh, especially the “eat this before your ice cream”. Even though I don’t get to be in DC to watch him grow, I get to envision much of it through your words. Thank you. You are currently reading Gems at Walking on My Hands.